Justin Bonomo Wins Event #11: $1,500 Six-Handed No-Limit Hold'em ($449,980)! Justin Bonomo took down the $1,500 Six-Handed No-Limit Hold'em event in rather quick fashion inside the Amazon Room today. He got heads-up with Mike Sowers within the first two hours of play and came back from a more than 4:1 chip deficit to capture the event’s $449,980 first-place prize and coveted gold bracelet. What started Monday with 1,587 entries was quickly boiled down to just ten players as play began at 1 p.m. But the real speed came in the move from ten players to the final table of six. Frank Debus dropped out of contention finishing tenth in just the first hand of play when he ran into Sowers’ and couldn’t improve. Todd Anderson, Viet Vo and Sebastian Pauli were sent packing as well and we were down to six. Sowers brought the chip lead into the final table, but after Daniel Strelitz got it in with against Taylor Paur’s and spiked a king on the river of a board, he took the lead. Sowers grabbed it back, however, spiking a miracle one-outer to bust Niel Mittelman. These two got it all in on a flop with Sowers on and Mittelman holding . The turn card came the , leaving Sowers with just one out. Sure enough, he hit the on the river and play went four-handed. Sowers soon rid the table of Lance Harris when Harris put it all in with and couldn’t improve against Sowers’ . It wasn’t long before Sowers and Strelitz then ended up in a preflop raising war that ended with Strelitz calling a Sowers shove with only to find Sowers on . The flop came and Strelitz had runner-runner outs to a royal flush or quads, but Sowers held on the turn and river. The heads-up battle started slow and Bonomo began battling back from a deep deficit. Within a level, he was even in chips and the hand of the tournament played out. Bonomo made it 75,000 and Sowers raised it up to 230,000. Bonomo made the call and they were treated to a flop. Sowers bet 260,000, Bonomo called and off to the turn they went. Sowers fired again at the , making it 510,000, but Bonomo would not go away. The river brought the and Sowers moved in, only to see Bonomo had hit the river hard, turning into a wheel. 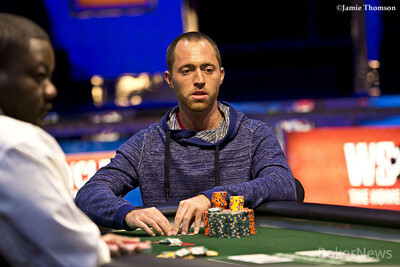 Sowers had flopped two pair with , but it was not nearly enough and he was left with just 25,000 in chips. He made it interesting, doubling up countless times over the next 19 hands. On the 20th, Sowers pushed in against Bonomo’s flopped flush and got no help on the turn and river. 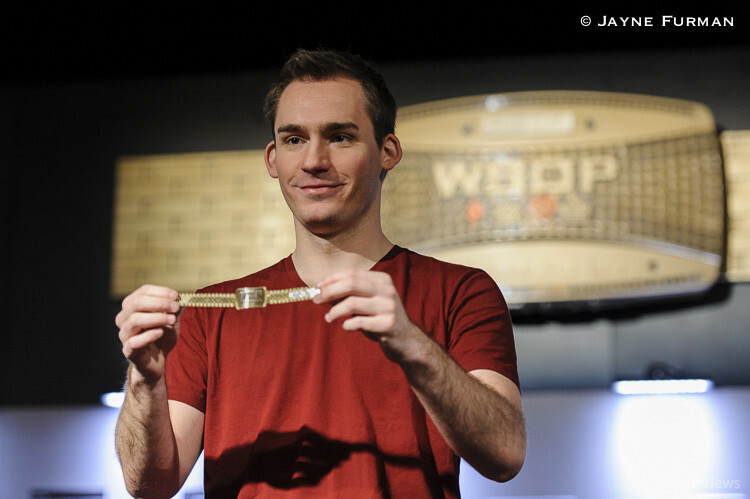 Less than one week removed from a heartbreaking second-place finish in the $10,000 Limit 2-7 Triple Draw, Justin Bonomo had earned his first World Series of Poker Bracelet and close to a half million dollars. Hand #161: Justin Bonomo made it 80,000 and Mike Sowers made the call. They saw a flop of . Sowers checked and when Bonomo bet 110,000, Sowers moved all in. Bonomo quickly called. A flopped flush for Bonomo, but a draw to a higher flush for Sowers who had managed a few improbable double ups so far this match. The turn was the and the river was the . Not this time, and the miraculous return from almost nothing was not going to happen. Hand #157: Justin Bonomo called and Mike Sowers checked his option. Flop of and Sowers checked. A bet from Bonomo took it down. Hand #158: Sowers moved all in and Bonomo called his all in for 600,000. Sowers had and Bonomo showed the . The board ran out . The straight on the river giving Sowers another double up. Hand #159: Bonomo made it 80,000 and Sowers called to see a flop of . A 100,000 bet from Bonomo won. Hand #152: Mike Sowers folded giving Justin Bonomo a walk. Hand #153: Justin Bonomo gave Mike Sowers a walk. Hand #154: Mike Sowers opened for 80,000, Justin Bonomo moved in and Sowers called with . Bonomo showed and after a flop, a turn and river they chopped the pot. Hand #155: Justin Bonomo made it 80,000 and Mike Sowers called. The flop came and Sowers checked. Bonomo bet 85,000 and Sowers folded. Hand #156: Mike Sowers opened for 80,000 and Justin Bonomo called. The flop was the and Bonomo and Sowers both checked. But on the turn Bonomo bet 125,000 and Sowers folded. Hand #146: Mike Sowers moved all in for 155,000 and Justin Bonomo folded. Hand #147: Bonomo moved all in and was called. Bonomo had and Sowers had . The cards ran out and they chopped it up. Hand #148: All in again with Bonomo holding against the of Sowers. The cards ran out and Sowers got yet another double up. Hand #149: Sowers got a walk. Hand #150: Bonomo got a walk. Hand #151: Bonomo moved all in and Sowers called. Bonomo had against the of Sowers. The cards ran out and Sowers got yet another double. Hand #139: Justin Bonomo made it 75,000 and Mike Sowers folded. Hand #140: Mike Sowers made it 75,000 and Justin Bonomo fired back, making it 275,000. Sowers folded. Hand #141: Starting the hand almost even in chips, Justin Bonomo made it 75,000 and Mike Sowers raised it up to 230,000. Bonomo called and the flop was revealed. Sowers bet 260,000 and Bonomo obliged with a call. The turn came the and Sowers led again, making it 510,000. Bonomo swallowed hard and slid out a call. The river was the and Sowers took his time before moving all in. Bonomo called immediately having rivered a wheel with . Sowers held and after flopping two pair he was outdrawn and left with just 25,000 in chips. Hand #142: They’re all in on the next hand with Sowers holding and Bonomo on . The board ensured a Sowers a double up. Hand #143: They’re all in again with Sowers on and Bonomo holding The board rolls out and and he doubles up again. Hand #144: Sowers gives Bonomo a walk. 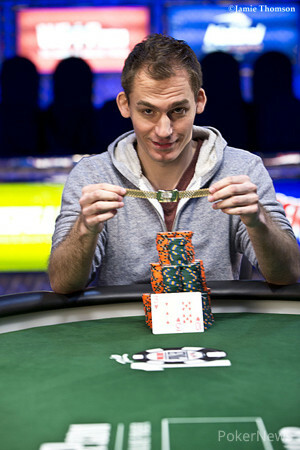 Hand #145: All in again: Sowers with and Bonomo with . The board gives Sowers another double. Register for Tonight's WSOP.com Online Championship Series Event! The 2014 World Series of Poker is well underway at the Rio All-Suite Hotel & Casino in Las Vegas, Nevada, but that's not the only place you can get your WSOP fix. From June 1-15, grinders in Nevada will be able to participate in the WSOP.com Online Championship Series. The 15-event WSOP.com Online Championship Series festival features more than $550,000 in combined guarantees, and the winners of the first 14 events will all receive an entry into the $200,000 guarantee WSOP Online Championship Main Event on June 15. Satellites are underway for as little as $3 right now on WSOP.com, and you can learn more about the series by clicking here. Hand #134: Mike Sowers made it 75,000 and Justin Bonomo called. The flop was . Sowers bet 100,000 and Bonomo called. The turn saw Bonomo check again and call a Sowers 210,000 bet. The river was the . Bonomo checked again and Sowers checked. Bonomo had but lost to the of Sowers. Hand #136: Sowers made it 75,000 and Bonomo raised it to 275,000. Sowers folded. Hand #137: Bonomo opened for 75,000 and Sowers called. The flop was both players checked to see a turn which was checked again. River and both checked. Bonomoo had and that was good versus the of Sowers. Hand #138 Sowers opened for 75,000 and was called by Bonomo. The flop was . Sowers check-raised Bonomo to 335,000 and won the pot. Hand #129: Justin Bonomo made it 75,000 and Mike Sowers folded. Hand #130: Sowers raised to 75,000 and Bonomo called. The flop came . Bonomo checked, Sowers bet 100,000 and Bonomo called. The on the turn brought a check from Bonomo and a 235,000 bet from Sowers. Bonomo folded. Hand #131: Justin Bonomo made it 75,000 and Mike Sowers called. The flop brought a check from Sowers. Bonomo bet 100,000 and Sowers called. It was the on the turn and both players checked to see the on the river. Sowers led out for 210,000 and Bonomo called. Sowers could show just nine-high and Bonomo flashed a king to take it down. Hand #132: Sowers gave Bonomo a walk. Hand #133: Bonomo made it 75,000 and Sowers called. Sowers checked the and called a 120,000 Bonomo bet. The turn was checked by both. But the river brought a 210,000 Sowers bet. Bonomo then raised, making it 700,000. Sowers let it go.